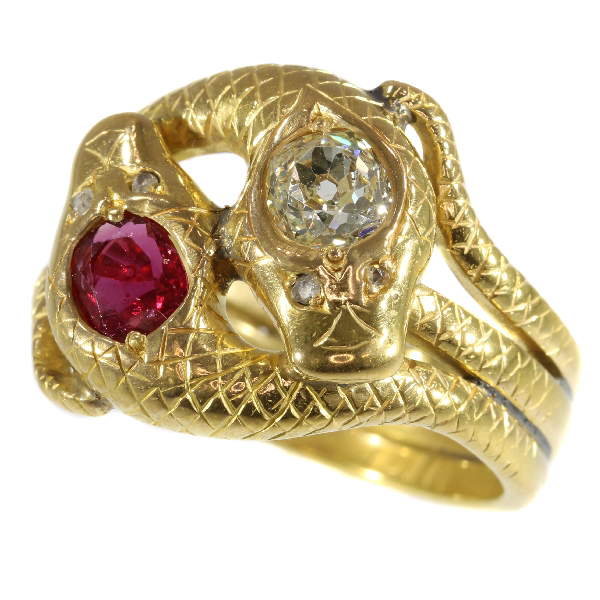 Late Victorian gold double serpent snake ring set with big diamond and ruby: Description by Adin Antique Jewelry. Style specifics: The style of this jewel announces the coming of the Art-Nouveau style. Diamond(s): One old European cut diamond with an estimated weight of ± 0.68ct. (colour and clarity: fancy light yellow, i). Four rose cut diamonds and senailles . A senaille is a simplified rose cut diamond, a small diamond chip with perhaps a few polished facets. We do not have the weight of the rose cuts diamonds nor the senailles which is normal in our trade when it comes to rose cut diamonds and senailles. Precious stones: One ruby with an estimated weight of ± 0.51ct. Treatment: most probably heat treated.